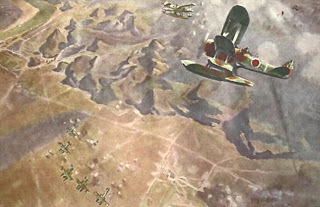 This contemporary painting (upper image) of a Nakajima Type 95 Reconnaissance Seaplane over China depicts a strong reddish brown and a surprisingly light green. It makes me wonder whether interpretations of the colours from monochrome photographs of 96 Kansen have got the colours reversed. Reddish brown photographs quite dark in black and white. The Type 97 Carrier Attack Aircraft (97 Kanko - Kyu Nana Shiki Kanjoh Kohgeki-ki) was another IJN type that received an application of green and brown camouflage during operations over China. Hasegawa's 1989 edition of the kit called for the brown on an attractive red-tailed China based 12th Ku example (lower image) to be mixed from 60% Yellow + 30% Brown + 5% Black+ 5% Red, all using GSI Creos (Gunze Sangyo) Aqueous colours. When the same kit was re-issued in 1995 the colour mix for a China based 14th Ku example was given as 65% Brown + 20% Black + 10% Yellow + 5% Red.